Leading the way to better braille solutions. At AMAC, we understand the importance of students receiving quality braille. We are also aware of the substantial costs. Our customization and reuse model, as well as access to partners within braille prison programs, allow us to offer timely, cost-effective, high-quality braille transcription, embossing, and tactile graphics to our members. AMAC Braille Services is able to produce customized projects to best suit your needs, including partial books and chapters, or graphics only, from both print materials and electronic text. Working with cutting-edge technology, our Library of Congress certified staff specializes in literary, computer, foreign language, music, and Nemeth code braille transcription. Our library of textbooks and print materials contain previously transcribed braille, which can help you save time and money. 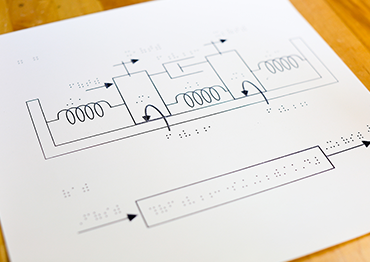 AMAC Braille Services will examine print materials, assess transcription requirements and provide an estimate quote. In many cases, a copy of the book or print materials will need to be sent or purchased by AMAC in order to provide an accurate quote on the transcription service. Once the quote is accepted, Braille Services staff will provide you with the expected production date and discuss preferred method of delivery.